Having seen an ignition coil overheat, melt and smoke prodigiously before I was able to cut the current, I am more than a little sensitive to smoking electrics, especially on a GRP car! So when recently I was testing the lights on the Bug and smoke started to wisp upwards from the steering wheel region it was all systems shutdown! I traced the source to this little chap, in the steering column lights and indicators multi-switch – the headlamp flasher switch contacts. The moveable contact, operated by the stalk, has three positions. When the stalk is pushed forwards, the contacts are open about 6mm. When the stalk is in the rear position, nearest the driver, the contacts gap needs to be about 2mm. It is only when the stalk is pulled fully towards the driver to flash the headlamps that the contacts actually meet, to light up the main beam. In my case the contacts were so close together in the stalk rear position that they were beginning to arc and burn. 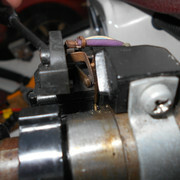 It was a simple matter of bending the front contact slightly further towards the front of the car to give a stalk rear position contact gap of about 2mm, and no more arcing or smoking. Access is easy once the cowl over the switch is removed, by slackening the C clamp on the underside of the steering column. I hope this may be of help to others in checking electrical safety on their cars, since the headlamp flasher is permanently live even with the ignition and the main lighting switch turned off. Having a kill switch on the battery meant I was able to cut all power immediately.